From the disaster performance that was England’s Three Lions to the triumphant applause for one enormous lion, the centre piece for the show of Paris’ archetypal couture master, Lagerfeld at Chanel. Imperial and military sprung to mind in the Chanel show as a raft of rich Prussian reds, navy, claret, brown and the ubiquitous camel walked the enormous catwalk in the shade of the equally enormous lion, a nod to Madame Chanel’s Leo star sign. The impact was awesome whether daywear or eveningwear as they bled seamlessly into each other. Tranches of tweed with fur trims whether falling on the knee as a pencil skirt of more voluminous version, jacket were cropped three quarter sleeve with a hint of ‘50’s styling and often, inimitably Chanel double breasted. A Russian red heavy silk damask dress rustled with shades of Dr Zhivago. Gold braid brooches hinted of nobility and rank. Richly embroidered, navy slub silk with equally decorated, ornate matching boots were worn casually like a Romanov lost princess. Saying that, there were enough simple, classic pieces in autumnal shades to please the ladies who lunch as well as the budding new Chanel clad celebrities. Lagerfeld zig zagged through all the shapes and forms that please his myriad customers creating order from chaos. Romanticism came via the frothy navy lace trimmed in black velvet with puff sleeves, simply divine. 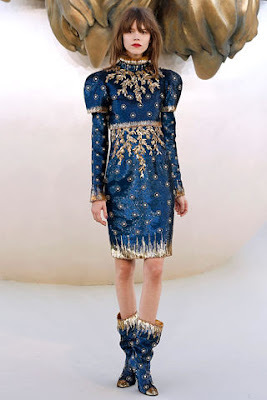 Embroidered bright metallics glinted while a demure but ravishing navy silk dress, tucked and gathered to perfection was simplicity adorned with a leonine braid belt. Models were bedecked with gold bracelets, wearing their trinkets on the run from revolution. This was masterful cutting. Make up was kept girly and youthful yet modern with clean eyes and berry or rust stained lips. Hair was controlled and contrived messy…like the busy young woman who hauls on her Chanel before rushing to an appointment. Often hair was tucked inside collars and jackets, another nod to modernism ie pairing classic Chanel with a very modern attitude. Emperor Karl knows best. Pictures kindly supplied by Getty via Daylife. To see more, please click on the link below. What do you think of the Chanel show? Please leave me a comment in the box below or in the ‘shout mix’ box opposite. If you would like to vote for Katie Chutzpah in the Cosmopolitan Blog Awards, simply click on the link on the top of the page. Previous post: Armani Prive 2010/11. Ice cool blondes in ice cool camel & mink. Next post: Gaultier wows Paris Haute Couture. High drama and higher turbans.